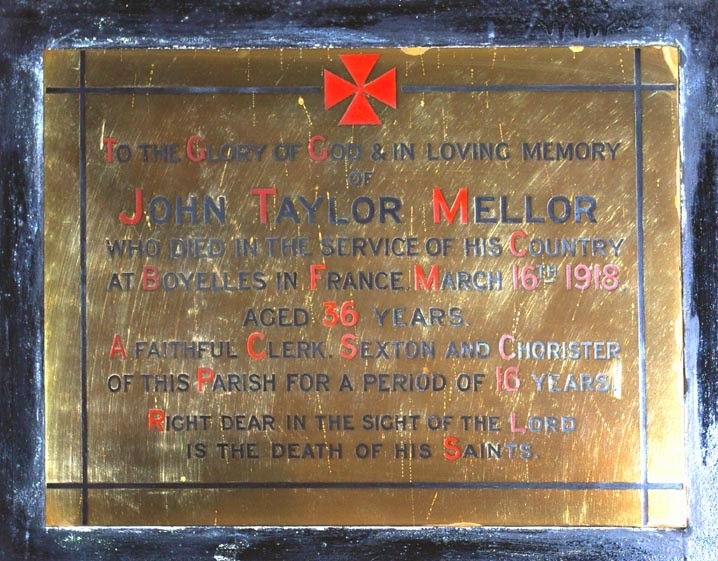 To the Glory of God and In Loving Memory / of / John Taylor Mellor / who died in the Service of his Country / at Boyelles in France March 16th 1918 / aged 36 years / A faithful Clerk, Sexton and Chorister / of this Parish for a period of 16 years / Right Dear in the Sight of the Lord / is the Death of his Saints. There are no names on the War Memorial Cross in Darton Churchyard, but John is also remembered in the History of All Saints Church Darton, written by James Dearnley some years later. John is buried in the Boyelles Communal Cemetery Extension in France and commemorated on the Commonwealth War Graves Commission website.